for $335,000. The lot size is 0.77. A great building lot located in Highlands Falls Country Club with spectacular views of Whiteside Mountain and Chimney Top Mountain. It would be difficult to find a buildable lot in Highlands with a better view. 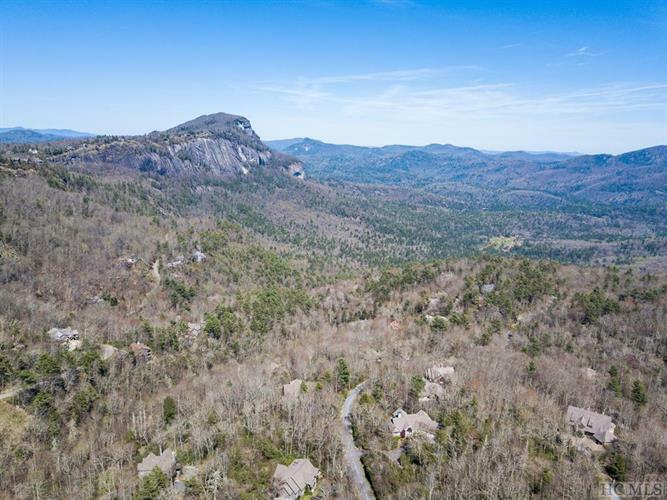 Located half-way between Highlands and Cashiers, you can enjoy each community in a ten-minute drive. Highlands is called the Aspen of the East with its award-winning restaurants, spas, art galleries, world-class shopping, a famous regional art center called the Bascom, a Playhouse, a Performing Arts Center and numerous hiking trails and waterfalls. Membership is not required in the Highlands Falls Country Club, however, many attractive amenities are available through membership in the club. The golf course is challenging and one of the most interesting courses on the plateau. Tennis, swimming, a very active bridge club, fine dining, a state of the art fitness center, and a best in class croquet facility are available to members. Application for membership to Highlands Falls CC is subject to approval by the club Board of Directors. In addition, having a 24 X 7 manned security gate is beneficial to the homeowners in HFCC and provides peace of mind. The building lot is located on Upper Divide in Highlands Falls County Club. Upper Divide is a highly desirable area within the Highlands Falls community of homes.